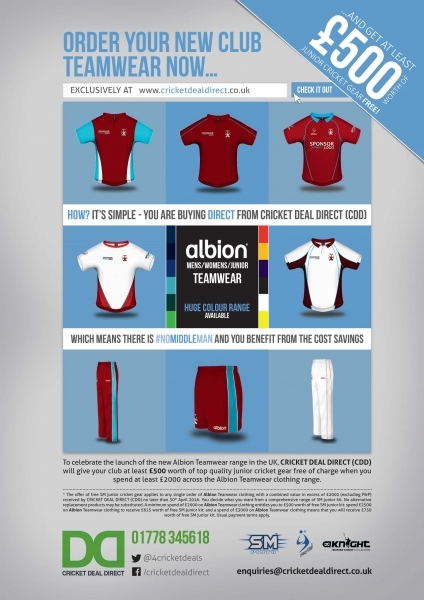 If you’re thinking about updating your club teamwear, here’s a great reason to talk to Cricket Deal Direct who have just agreed an exclusive distributor contract with Albion Sports in Australia to supply their superb quality teamwear to UK clubs (on a bulk order basis) including men’s, women’s and junior ranges. That’s right, the range includes teamwear designed specifically for women. Details are on the website ( www.cricketdealdirect.co.uk ) with a great launch offer for you to think about if you’re looking to update your club teamwear. First and foremost, Cricket Deal Direct (CDD) know that every club is different and want to make sure that you get exactly what you want. Use the web site as a starting point, from which you can see that there are lots of colour and design options. It will probably prove helpful for the club committee and members to discuss the style, design and colour of garments needed at an early stage. This will normally be followed by a club visit to look at the range and for you to see samples of this top quality clothing range. Sizing for both Adults and Juniors will usually be discussed together with the club – quite often when looking at samples. Club logos and sponsor logos can be discussed – these are produced and applied on the clothing by CDD at their own UK in-house facilities. Eventually customers can buy from web site, but at this stage it is more of a shop window. How can Cricket Deal Direct afford to do this? By importing direct, CDD is cutting out the middleman and able to pass those savings on to the customer as well as launch Albion Teamwear with this great offer. Cricket Deal Direct (CDD) sources quality cricket equipment from manufacturers and craftsman across the world to provide the cricketer with a one stop shop online service of the best brands. Albion has long been known worldwide as supplying the famous Baggy Green caps but also provides almost all test nations, the ICC and thousands of clubs worldwide. The connection between Albion and CDD means further opportunities to expand the growing professional grade Albion Teamwear & Headwear range in a new region of cricket lovers. Albion Chief Executive Brendan Denning had been working on developing partnerships in the UK over the past year and says “Despite our Ashes battle lines the team at Albion is excited about our new partnership and the opportunity to expand our brand via our Teamwear & Headwear range into the UK with Cricket Deal Direct. With a new helmet range to follow it is an exciting time to wear Albion. Albion is looking forward to partnering up with CDD to benefit cricket at all levels in the UK for the 2016 summer. For more details email enquiries@cricketdealdirect.co.uk as well as asking about a great launch offer that means your club can get at least £500 worth of junior cricket kit free of charge with your club teamwear order.